You can get your free copy down below…read on for more. An attorney has an ethical and legal obligation to only work in your best interest and inform you fully. Does a non-attorney Medicaid planner have the same ethical and legal obligation? Does a non-attorney Medicaid planner have malpractice insurance? The Florida Bar regulates attorneys in Florida. Who regulates non-attorney Medicaid planners? Four things a non-attorney Medicaid planner is not allowed to do in Florida that only an attorney can do. 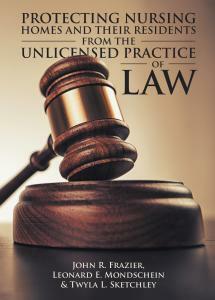 Get your Free eBook on Protecting Your Family Assets from the Unlicensed Practice of Law by clicking here now. Do you want a Free printed copy of the book and you or your loved one live in Florida? Just fill out the form below and we will send you a copy. In their book, “Protecting Nursing Homes and their Residents from the Unlicensed Practice of Law,” Florida Attorneys John R. Frazier, Leonard E. Mondschein, and Twyla L. Sketchley document how seniors become sitting ducks for non-lawyer insurance salesmen, financial planners, disbarred attorneys and others who appear to be legitimate Medicaid planners, as well as so-called Medicaid planning companies that profess to work with lawyers. The handbook raises awareness of an ethical and fiduciary tragedy that happens all too often to Florida’s aging citizens. The tragedy is the Unlicensed Practice of Law, or UPL, related to Medicaid planning services. By reading this book, Florida seniors and the long-term care facilities in which they reside will become financially safer and wiser as to the right way to engage in Medicaid planning. Medicaid planning is a complex legal field where, if mistakes are made, the applicants can be financially devastated. Medicaid planning should only be done by licensed attorneys with specific training. But most seniors and their families in financial need are not thinking about this. They are bewildered by the nursing home’s admissions process and overwhelmed by their sudden financial consequences. What are the things a nonlawyer Medicaid planner can and cannot legally do? Can a nursing home get in trouble for working with a nonlawyer Medicaid planner? Is financial exploitation concerning UPL and Medicaid planning a form of elder abuse? What is the penalty if someone is charged with UPL? How can a nursing home protect its rights? How can an elderly Medicaid applicant protect his or her rights? How does one file a UPL complaint in Florida? This handbook is part of an extensive effort to protect Florida seniors from financial exploitation through prevention and awareness. We must all work to increase public awareness about unlicensed individuals who engage in Medicaid planning, but shouldn’t. John R Frazier, J.D., LL.M. is a member of the National Academy of Elder Law Attorneys, the Academy of Florida Elder Law Attorneys and the Florida Bar Elder Law Section. John is admitted to practice before the United States Court of Appeals for Veterans Claims, and he is accredited by the Veterans Administration to assist VA claimants present, prepare and prosecute claims with the VA. John can be reached through his website: EstateLegalPlanning.com.